Have you ever tried to start seeds indoors and ended up with anemic, gravity challenged sprigs? Bright, direct light is vital to emerging seeds and most windowsills are not sunny enough. This leaves electric grow lamps or real sunlight with cold protection as the best two options. 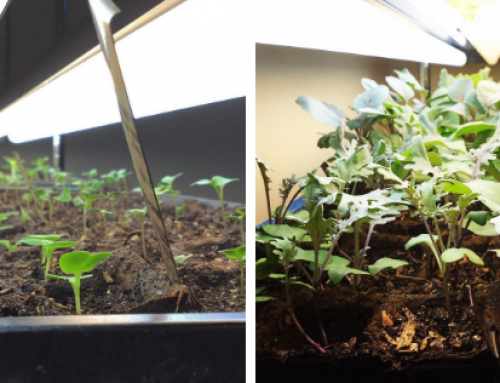 Artificial lighting (grow lights) is a good choice for some people, but not for us. Our indoor space is at a premium and we didn’t want our electric bill to go up. Since our intensively planted garden is also limited in extra space, we’re lucky that a greenhouse isn’t the only winter sunlight option. Given our circumstances, cold frames are the best option, since they are more flexible within smaller spaces, plus they’re easier and less expensive to build. 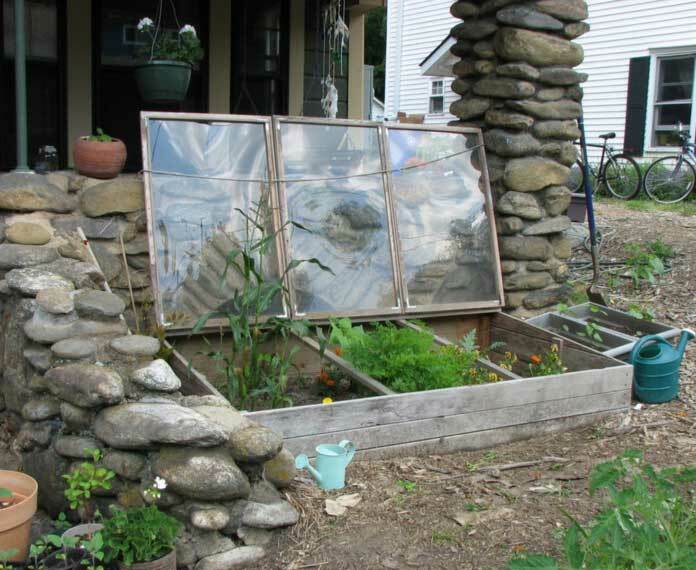 Not everyone has a greenhouse, cold frames are a more frugal option for both money and space. What Is a Cold Frame? In case you aren’t familiar with them, a cold frame is exactly what it sounds like: a frame of some sort that protects plants from cold weather. It also lets the sunlight in so the plants can continue to grow. 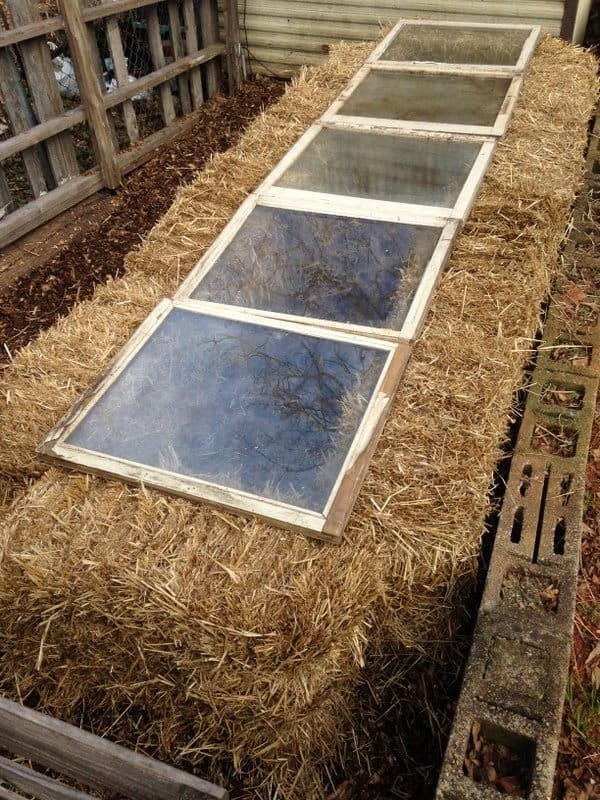 In most regions, a cold frame can be used effectively to grow winter seedlings and crops, though if you live in a climate zone below USDA zone 6, you may need a more fortified version than the one I use (here’s a good example on Mother Earth News). A cold frame can be constructed from materials you can easily find. This one, photographed in Asheville NC (zone 7a/6b), is made from lumber and some old windows. Also, if you don’t feel like making your own cold frame, here’s a really good Austrian/German-designed cold frame you can get from Amazon. It’s double sided (more space), made of durable materials, lets in light from all angles, and you probably couldn’t make it more affordably if you were to buy all the pieces/parts yourself. 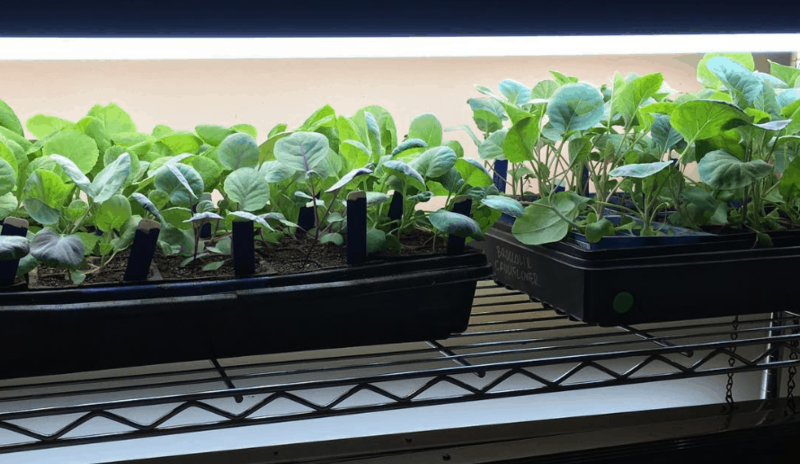 Cold frames are typically unheated, and all their plant-protecting power comes from solar energy stored in the structure and soil during the day. A light-permeable cover like glass, plexiglass, or greenhouse plastic is used for the top, and the sides are made of any material that will create a supportive structure for the cover. 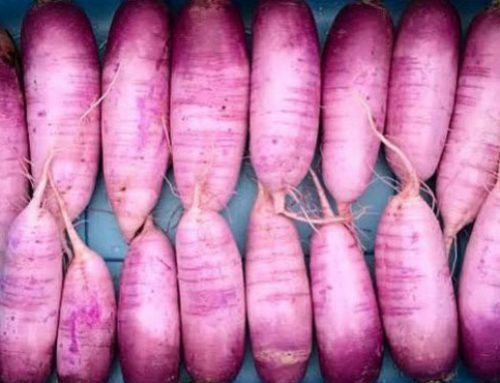 A bottom is not necessary—most people just use soil. If you decide to create a base for your cold frame, make sure it allows water to drain. 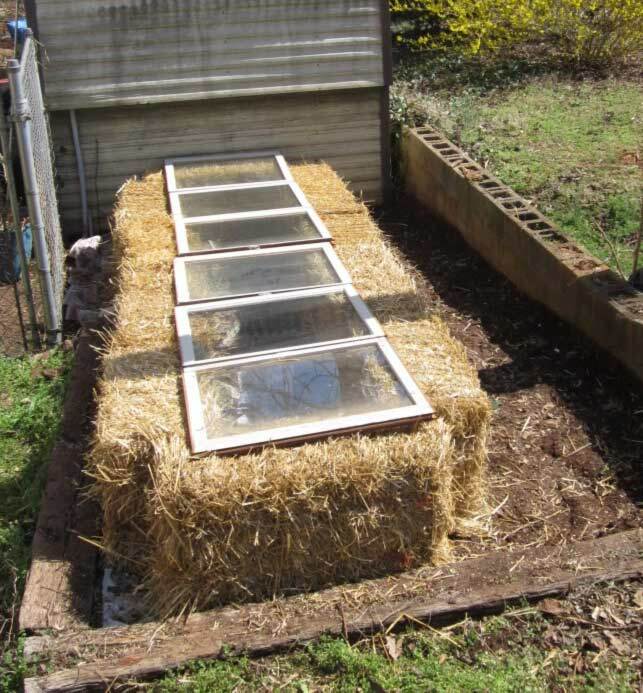 Our cold frame constructed from straw bales and recycled windows. 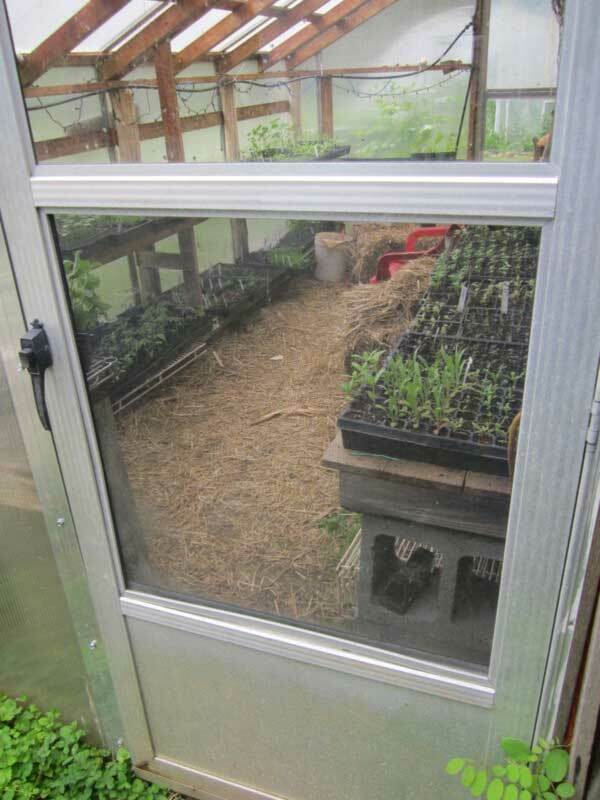 We used recycled windows for our cold frame. Some of them came from a friend’s farm, some of them came from my husband’s coworker, and some of them came from our local Habitat for Humanity store. Glass is the most transparent and permanent material you can use… unless you live next to children playing ball or position your cold frame under the Whomping Willow (or any aging tree). 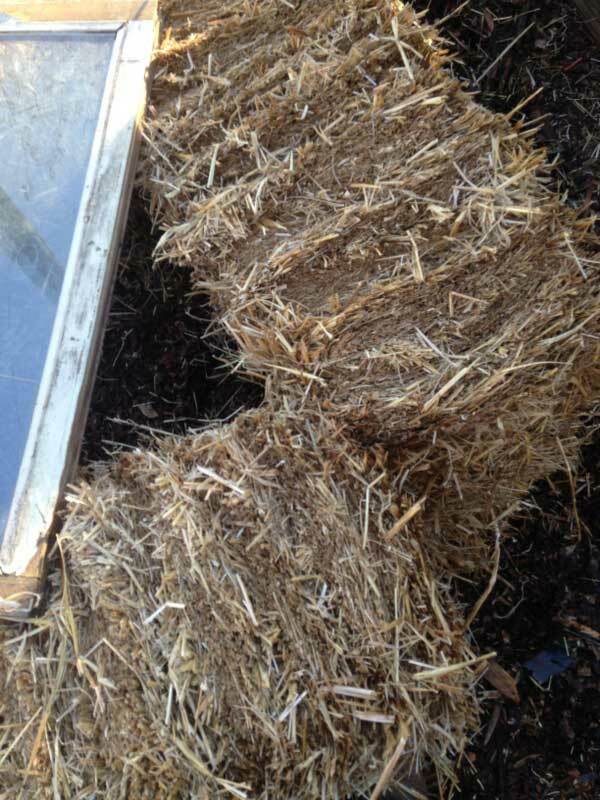 Depending on how cold your weather gets you may want your straw bale joints to overlap more. In very cold areas be sure to stuff any gaps with loose straw or leaves. 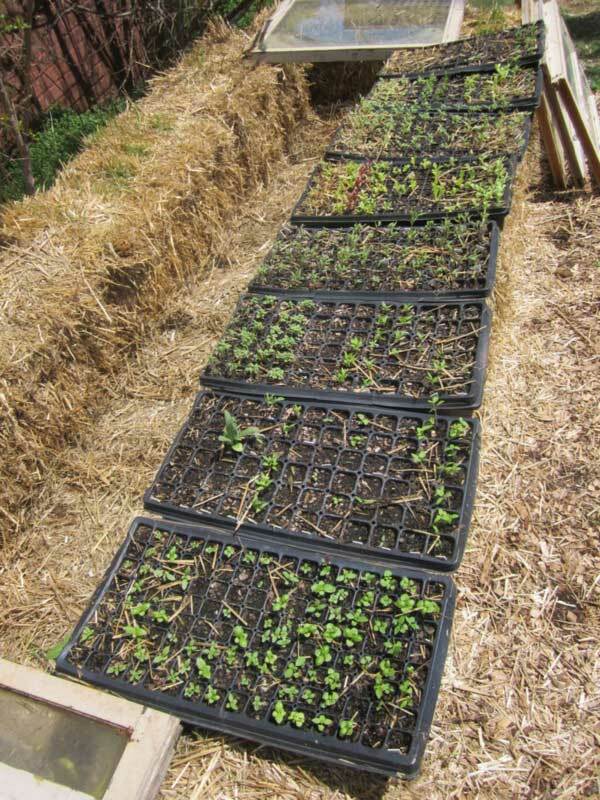 Straw has been our material of choice, although people use lumber, bricks, and many other materials to create cold frames. In our case we don’t have a permanent spot to keep our cold frame in, so it has moved around the past 3 years. Sometimes it is in our driveway, sometimes next to our shed, and sometimes it is out in the garden. When the summer plants are dormant we could even put a temporary cold frame on top of one of our late-emerging beds. The upside of straw is that the bales are thick and insular, they’re easy to come by (garden, home improvement, and farm stores), they’re relatively inexpensive (in bad hay years the price goes up), and they are fully biodegradable when we are finished with them. At this point we’ve been using straw for 3 years and have found it perfectly suited for our needs. 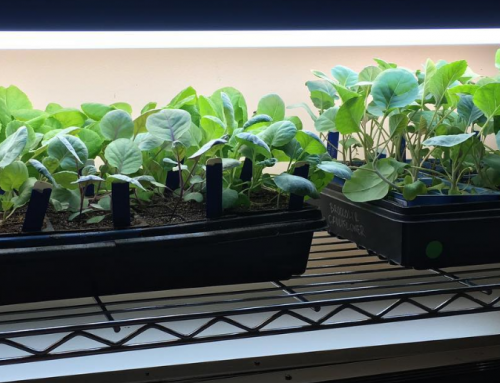 I had given up on shelf greenhouses or ever getting around to building a wooden cold frame and was carrying my seed trays in and out of the house on warm days. Needless to say I am much happier with our cold frame! Plants stay toasty warm inside, but so do the critters, watch out for slugs and other plant-munchers. You can put a straw bale (or any cold frame) just about anywhere in the yard, but the best places get south-facing sunlight. The least effective placement is on the north side of a house, building, or tall tree. Seed trays and potted plants aren’t the only use for a cold frame. 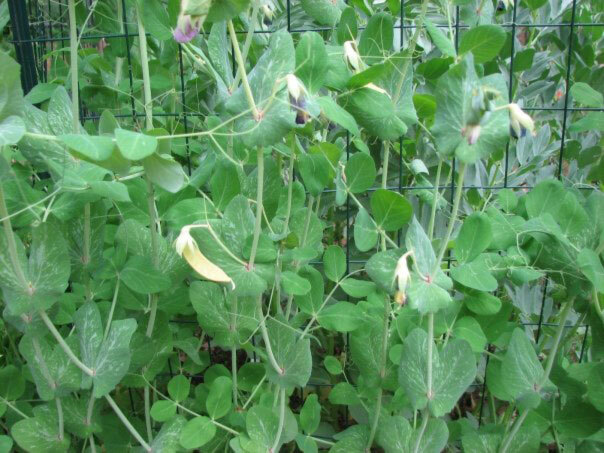 You can put them directly over a half-hardy plant in the garden like these golden snow peas and remove the structure when the weather warms in the spring. Since the plants inside will only be a little bit warmer than the outside air, cold frames are mostly used for frost-tolerant crops. These are indicated by the blue rectangle on the upper right of your GrowJourney seed packets (if you’re a GrowJourney member). You can also use your cold frame to grow out your spring transplants, but pay attention to the weather and bring the more tender seedlings inside on nights when it drops below freezing. 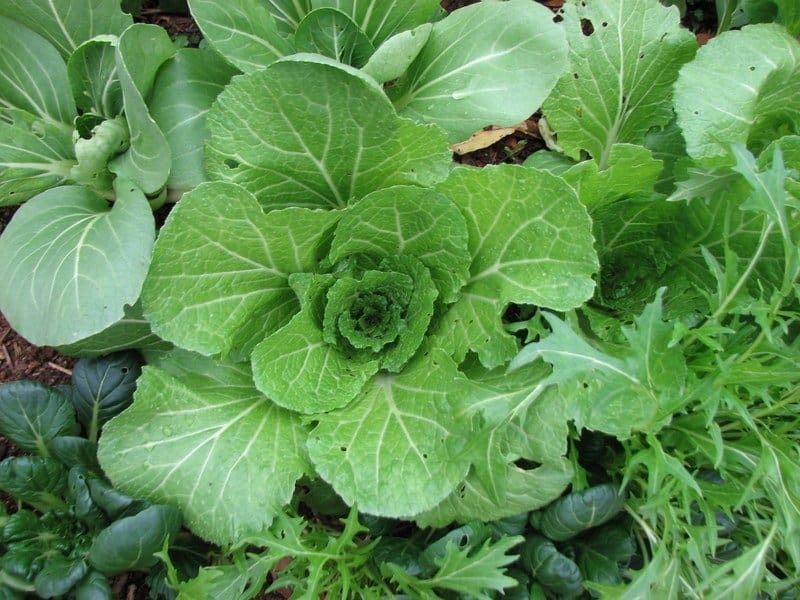 Don’t forget that all sugar, snow, and shelling pea varieties have edible greens. 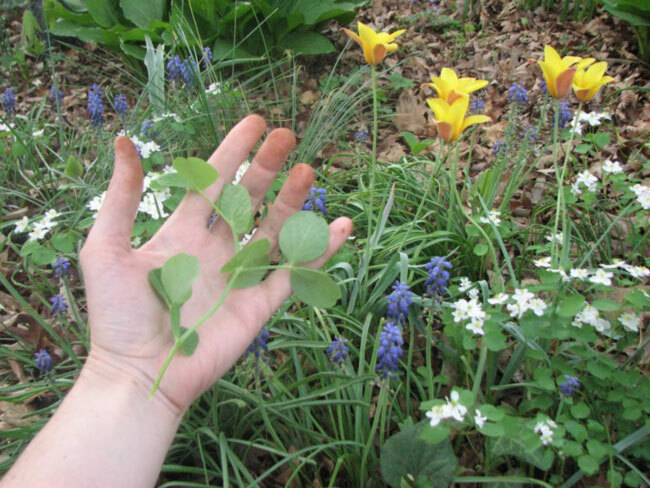 Plant Austrian winter peas or any other type and harvest salad greens all winter long. Although most winter crops are at least a little bit frost tolerant, they don’t grow when it is under 40 F outside. 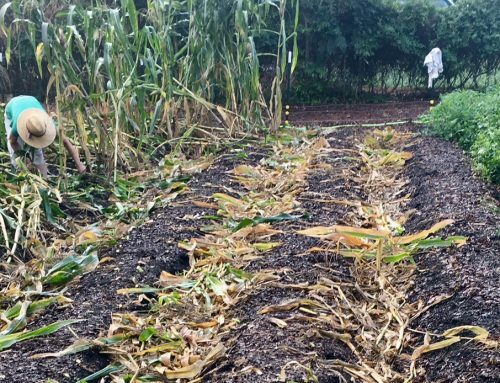 They appreciate the cover staying on any time the weather is colder than 50 F. Likewise, cool weather crops don’t like it hot, if the thermostat says 50 F or warmer, crack the cover or take it off completely. You’ll start to get a feel for how warm or cool your cold frame stays as time goes on. 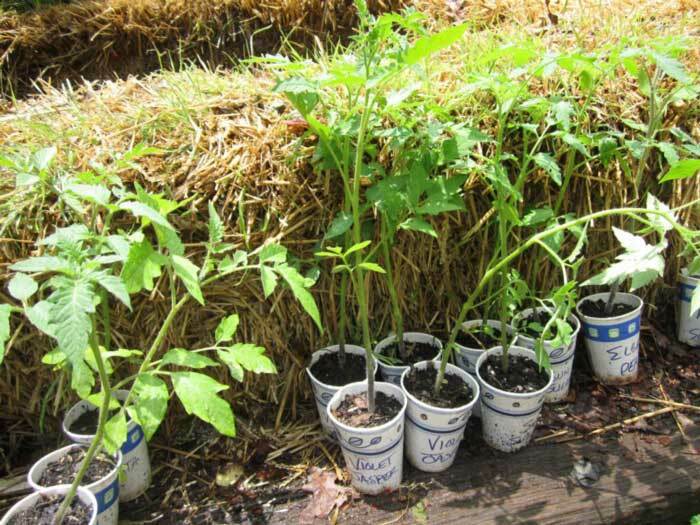 These tomato seedlings were grown out in our straw bale cold frame. By spring you’ll start leaving the cover off all the time. We usually leave ours up until we’re well past any freak freeze dates and then we give the bales a second life by sticking them under our rows of blackberry and raspberry brambles. When the berries leaf out and send out new canes they rest on top of the bales and block light from competing weeds. While the bales are under the brambles, they become hosts to mushrooms and other soil organisms. We think the summer mushroom colonies mycoremediate any herbicides the previous farmer used. That’s good, because by fall the bale weed barrier has rotted enough to lose its form. The bales get a third life in the garden when they’re dumped in the chicken run to be dismantled as a precious feast by our laying hens. At that point they become compost that we can use to fertilize our next batch of seedlings! 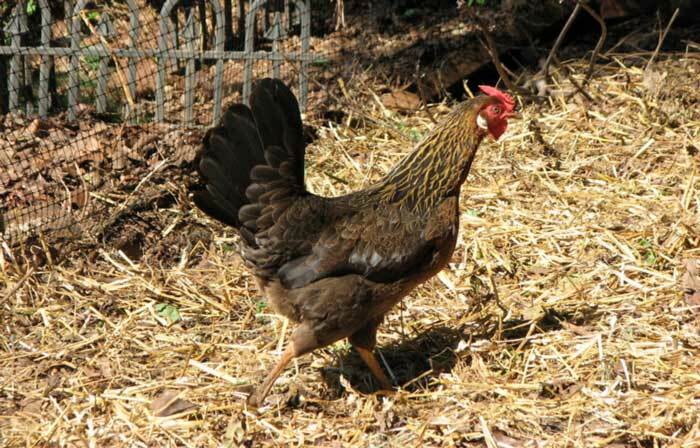 One of our chickens enjoying what’s left of a straw bale. Very useful article. Thanks for the info! Thanks Mike! Glad it was helpful. Like the whole straw thing … pretty cool! Tomatoes and squash really need lots of heat to produce well – lows no lower than 60s and highs in the upper 80s. It’s really hard to replicate that outside of a greenhouse environment in the wintertime, and it probably isn’t worth the effort. That being said, we certainly wouldn’t discourage anyone from doing garden experiments if you think you’ve got a nifty idea that will work. There’s only one sure way to find out, and that’s via trial and error.